People ask me if I eat fancy food every day. There's a real simple answer to that: no. I often eat fun food, things that might not be very difficult or made from expensive ingredients, but that are nicely put together and often with little twists - sure. But I have to show you this plate of orange-ness, because it's what I had for dinner a few days ago. 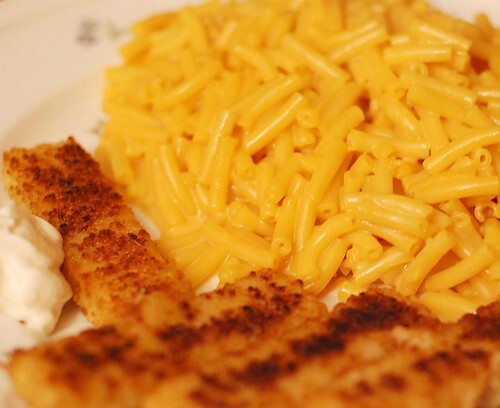 That's Kraft Macaroni & Cheese (one of my favorite foods in the world, by the way) and.. fish sticks. With a dollop of mayo. Gourmet might not be my middle name. But this sure hit the spot! If all has gone to hell: ready made pytti-panna with tons of pickled beets. french fries with mayo and fish sticks. Oh there are too many of these dishes. Yesterday was surprise a la freezer. Un.labelled box. Turned out to be chicken. Not bad. A good bratwurst (or two) with french fries always sets me straight! Not good for you but just good! I like hot dogs with mild mustard and ketchup, or macaroni cheese! We often do the same thing. Mac & Cheese, Fish Sticks, Tater Tots...sometimes you just need a break and a little treat like this makes me feel good. LOL!! My husband adores fish fingers and sometimes I join him, although we have oven chips on the side. With LOTS of mayo! We often have deeply uncool, unfashionable food - I just don't bother blogging it. Grilled cheese sandwiches, hot dogs (for nick), tuna salad (for me), sardines on toast - even tinned soup when it's late and I'm really lazy! I sometimes remind people that Cooksister is a BLOG not a reality show, and i'm not honour bound to show people everything I eat! Eating good food means, for me, that I only eat food that I really like. a quick snack or a lunch can be two boiled eggs and a tin och mackerell in tomato sauce. I love it! Food that is considered out of fashion, such at th swedish classic "macaroni stew", macaroni cooked slowly in milk and seasoned witk salt, white pepper and nutmeg, served with a few well-fried slices of the Falu sausage... not bad either! I love fish fingers, too! When my now husband invited me to his place for the first time after we met, he made fishfingers, broccoli and boiled potatoes. With mayo. I loved it. might not look so great...but it IS great. Hey, that's one of my comfort food suppers. Fish sticks and Kraft Dinner (as it is called in Canada). My late mother made it for us growing up and seeing your post was a blast from the past. And btw, it's still one of my faves! Great post! Thank you for such an honest post, Anne! We, too, adore boxed macaroni & cheese and eat it probably three times a month, paired with some sort of protein--a pork chop, or a ground beef patty. Another guilty pleasure for us is... *gulp*... McDonald's. Super Size me all the way! I love that junk and crave it fortnightly. Perhaps that's just my body starting to go into detox? The blue box is my fall back meal. By myself or to share - I like it. I also like homemade M&C, but they are two different creatures. People also think I eat gourmet all the time - I just don't have tht kind of time.